A green oasis right in the center of Phnom Penh located between the Royal Palace and the Independence Monument. 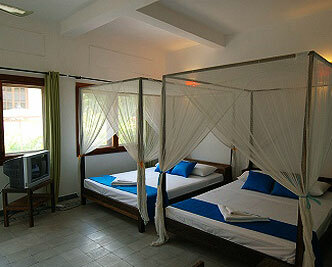 11 rooms, most with a private terrace or some with bunk beds all of which covered by free Wi-Fi or LAN. A large pool, a small shallow pool, salt water (natural sea salt from Kampot) is used with a computerized chlorination system and 24 hours filtration. Day beds spread around the garden and a garden bar and restaurant covered by free Wi-Fi.